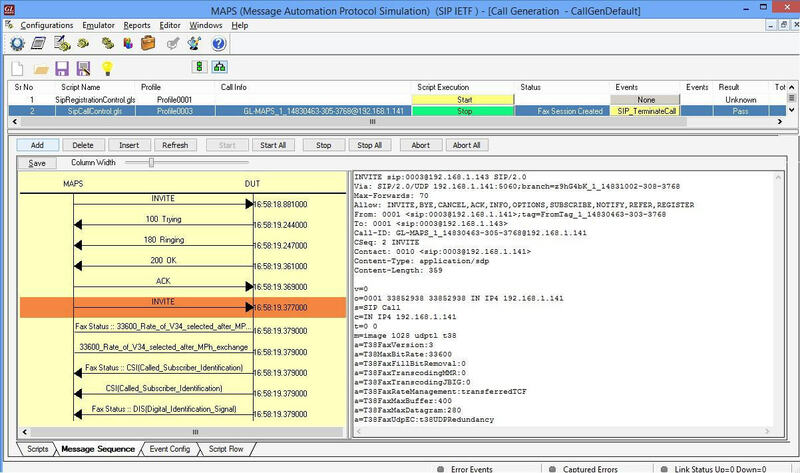 GL offers a variety of test tools to perform FAX over IP (FoIP) simulation and monitoring. Fax simulator supports both RTP G.711 Pass Through Fax Simulation (PKS200) and T.38 Fax Simulation over UDPTL (PKS211). Almost all MAPS™ IP based simulation products supports FAX simulation using any of these two methods. Typical applications of our Fax Simulators include load testing of fax servers, qualification testing of T.38 Gateways, testing of ATAs (Analog Terminal Adapters), testing of internet-aware fax machines, and many more. With respect to channel capacity RTP pass-through supports up to 120 Fax ports, whereas T.38 fax simulation over UDPTL supports unlimited channels, and constrained only by CPU capacity. Almost all MAPS™ IP products support fax simulation – MAPS™ SIP, MAPS™ SIP-I, MAPS™ MEGACO, MAPS™ BICC, MAPS™ GSM, and MAPS™ UMTS. 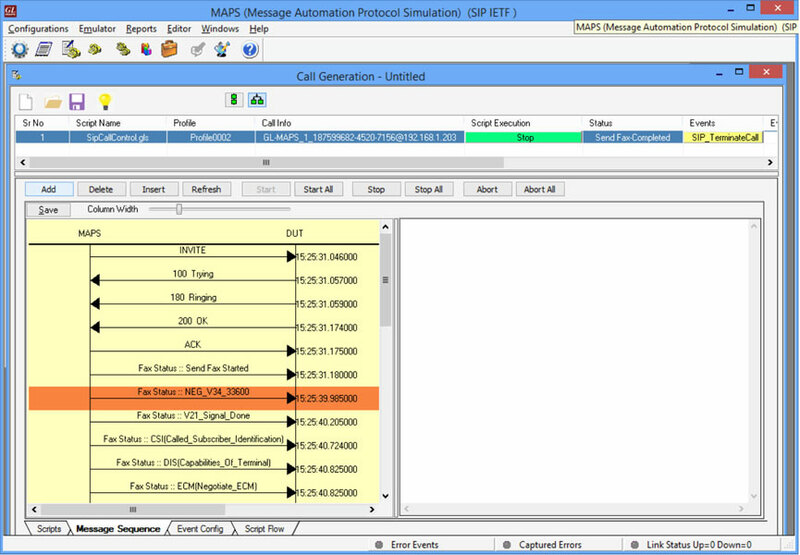 MAPS™ allows the user to initiate fax calls by sending call control messages using proper scripts and profiles. The profile allows necessary parameters of call control messages to be changed during runtime. The below figure depicts the T.30 fax call being generated using MAPS™ SIP. GL’s RTP Fax Simulator simulates multiple fax calls over IP in T.30 pass through mode (using G.711 PCMU and PCMA). It can transmit pre-recorded Tiff image to DUT (Real-time Fax machine), receive Pass-Through fax from DUT, and record complete fax call messages as log file along with a Tiff image. MAPS™ SIP generates Re-Invite to switch from audio mode to image (FAX) mode. While the call in progress, the MAPS™ also provides events related to the progress of the call. After completion of the call, MAPS™ provide call quality statistics. GL’s RTP Fax over UDPTL transport simulates multiple fax calls over IP using T38 protocol (compliant with ITU-T T.38 (03/2002)) up to maximum of 33.6 kbps speed. The below figure depicts the T.38 fax call being generated using MAPS™ SIP.